“I used to sit right down there when I was kid”, motioning up the third baseline, now a picnic area, but back in the day had bleachers for black patrons that came out to see the Savannah Indians. “My daddy used to drag me to the games and been hooked ever since”, Willie said. When Mr. Willie started coming to the games, it was simply “Grayson Stadium”. It was newly remodeled and the south was segregated. Now, it’s known as “Historic Grayson Stadium”. The stadium was built in 1926 and is the oldest working minor league ballpark in America with a capacity for 4,000 people. Originally known as Municipal Stadium, the park underwent major renovations in 1941 following a devastating hurricane in 1940. General William L. Grayson led the effort to get the $150,000 needed to rebuild the stadium. Half of the funds came from the Works Progress Administration (WPA). In recognition of Grayson’s work, the stadium was renamed in his honor. Jackie Robinson integrated Major League Baseball when the Brooklyn Dodgers started him at first base on April 15, 1947. Exactly six years later, the first South Atlantic League game with both Black and White players took place at Grayson Stadium on April 14, 1953. The Indians were the first team to break the color line when Al “Izzy” Israel and Junior Reedy started on Opening Day in 1953. Mr. Willie, who was there, remembers Junior Reedy saying at the time, “it brought more black folks to the stadium.” A month after Opening Day, 15,363 fans packed the house on Merchants Appreciation Night to set the largest single-game crowd in Savannah history. “My daddy wouldn’t pay a dime to watch football, but would for baseball, he took to it” Willie smiled recalling his father. “He knew baseball very well. He read that paper, those statistics of all the players, used to listen to the games, too. I had no choice, he dragged me to the games”. Willie motioned to the trees behind the outfield wall, “Those trees were not that big when I started coming here, not even half the size they are now”. He chuckled, “I saw Hank Aaron hit a few balls into those”. When the game started, we stood and the National Anthem was sung. Willie stood and sang along. I appreciated the effort and he seemed to enjoy it. As we sat back down someone came with food for Mr. Willie. “I’m treated well here. They don’t charge me for anything. When new Managers, Owners, Directors come to the Sand Gnats, they make sure to introduce themselves.”, Willie stated very unassumingly. “I can’t complain and they invite me to some of the team events. It’s like I am a part of them”. Mr. Willie Smith Jr., husband to Gloria and father to Michelle and “Willie Smith, III“. Willie “the third” played in the Major Leagues signed as a free agent by the Pirates in 1986. 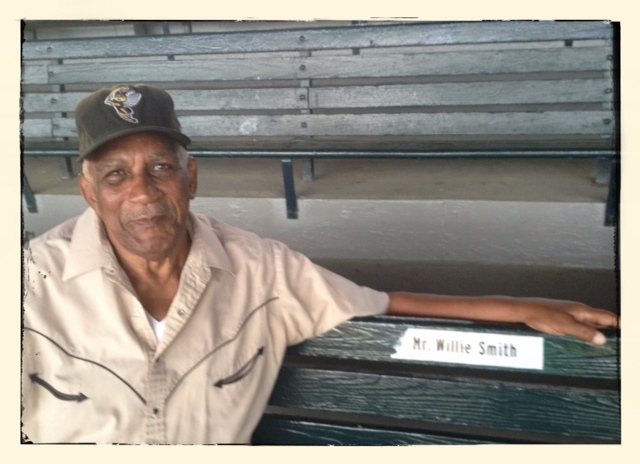 Mr. Willie is well known at the stadium and in Savannah. He has come to watch all the Sand Gnats games, and has come out to Historic Grayson Stadium for as long as he can remember. Currently 75 years old, he figures, “It has been at least 70 years or more.” I noticed Mr. Willie when I found a seat behind home plate. As I was waiting for the game to begin, I kept seeing people wave to someone behind me. This ‘person’ would yell out to them. I saw some players motion his way, also, and one of the coaches. I looked back and saw this elderly black gentleman, the mascot pointed and I knew I found a story. I approached him and explained what I was doing. He laughed and told me I could write about him. Mr. Willie is used to this as he was interviewed by a local news station the night before. For him, this has been happening for years. Mr. Willie told me once in a while he will go down into the dugout and talk to some of the players before the game. He likes to instruct them on how to hit the ball, but doesn’t know if they take his advice. He explained that he becomes disgruntled at times with the current manager, who makes him mad, with the way he manages the game. Willie likes small ball and doesn’t understand why the manager doesn’t bunt more. At times the manager makes Willie look bad when his way works out. I had to laugh when Willie was yelling for a player to bunt and the batter followed his “advice”. He beat out the throw to first by the pitcher. Willie kept saying, “you will beat out the throw big boy, just bunt!” He turned to me and said, “They should listen to me more.” He laughed at what he said with his easy going manner. The game was flying along and during the seventh inning stretch, Willie stood up and sang “Take Me Out To The Ball Game” like he did with the National Anthem. There was no pretenses with Willie. What you saw is what you got. “Willie comes alone to the games but someone is always sitting and talking to him”, Jon Mercier stated while smiling. At this game it was me, his friend George, and another gentleman who drives 20 miles to the stadium to attend the home games. “My Daddy was a railroad man, did the route from Savannah to Atlanta. He grew up in Cairo, Georgia, same as Jackie”, Willie said without being prompted. His favorite MLB team growing up was the Brooklyn Dodgers because of Jackie Robinson. Before the South Atlantic League was integrated, “Jackie Robinson came through Savannah but he wasn’t allowed to play even though he was with the Dodgers at the time.”, Willie shook his head at this. I inquired why he liked to come to the games so much if it was only white ball players. He looked at me kind of puzzled and said, “They played so well. I love the game but it is not like it was then. Back then they didn’t have so many errors.” I inquired again about the segregation aspect. He said, “My daddy never paid attention to it, it wasn’t that bad. My daddy never lived long enough to see white folks and black folks sitting together, but he did get to see Babe Ruth play here”, he said with a smile. Mr. Willie wanted me to understand that there was segregation, but a lot of the times it wasn’t enforced as he got older. Throughout the game Willie was very vocal. He would interrupt our conversation to yell encouragement to the players. “Settle down pitcher, settle down big boy”, or, “Put the wood on that ball.” I loved it. He yelled at a few women to sit down in front. They turned around and waved with big smiles knowing Mr. Willie was playing with them. A few of the concession workers would walk through, wave and he would wave back explaining to me who they were. He lives nearby, but now drives to the games instead taking the bus, or riding his bike, like he did when he was younger. In closing, Willie remarked, “I will be here as long as they have baseball in Savannah; or, as long as the Lord lets me. I love this game”. So do I Mr. Willie, so do I! Again, as always, I wish I could do this story justice. Mr. Willie was very interesting and he had so much more to say. I am very grateful he shared part of his life story with me. It was great watching the Savannah Sand Gnats play the Delmarva Shorebirds in this truly “historic” stadium. A stadium rich with history and memories. Being able to sit, talk with and listen while watching the game with Mr. Willie, I was very happy! Great story John and if you keep this up you may be a great reporter or writer someday and you already write great yes! Definitely hitting your writing stride. Great blog post.